If you put a little guy on a big table, it�s not like you�re guaranteed to see some fireworks. Now, if that guy happens to be one of the greatest shot-makers of the last 20 years, the odds might get bumped up a bit. Alex Pagulayan was playing Fedor Gorst at this year�s Big Foot 10-Ball Challenge at the Derby City Classic � a 16-player, single-elimination tournament played on a custom-made 10-foot Diamond table. The diminutive Filipino drew the cue ball too far and fell out of shape when he got to the 8 ball. 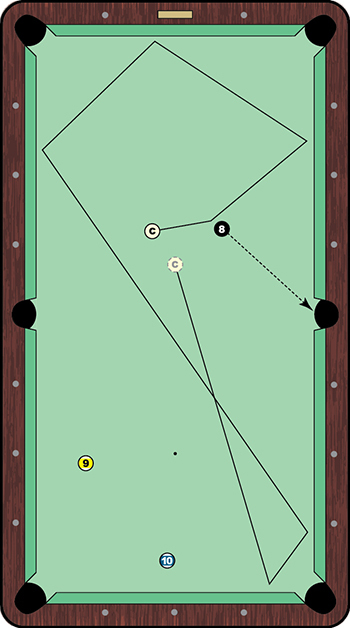 With an awkward angle into the side pocket, Pagulayan didn�t have a natural path back down table to the 9 ball in the bottom left pocket. With a firm, punchy stroke, he drilled the left side of the 8 ball, which went directly in the side pocket. The cue ball flew into the right long rail and quickly ricocheted off the head rail and left rail as it made a beeline for the bottom left corner. After hitting its fourth and fifth rail, the cue ball rolled toward center-table, in perfect shape for a shot on the 9. Showcasing such elite speed control, Pagulayan even managed to keep from being straight-in on the 9. He had a natural angle for position on the game-winning 10. Pagulayan cleared the table to grab a 2-0 lead in the race-to-11, but Gorst came roaring back for an 11-9 match victory.